Most of our eBooks can be read on Apple's iPad and iPhone portable devices. To do so, you need to purchase the EPUB or PDF version of a title and install iBooks or another eReader application on your device. Search the Apple App Store to download any of these applications. Note that at the time of this writing it was not possible to read eBooks purchased outside of the Amazon store or B&N store on any of the Kindle or NOOK apps, respectively (for iPhone, iPad, Android, PC, or other devices). It is possible that future updates will change this. If this happens we will update these instructions to include the use of those apps. In the meantime EPUB and PDF files purchased from our store can be read on the Kindle and NOOK devices themselves. For more information see the Kindle and Nook and Other Readers sections of this FAQ. There are several eReader applications available for the iPad and iPhone, but the most popular is iBooks. This is a free application developed by Apple for use on its iPad, iPhone, and iPod Touch devices. 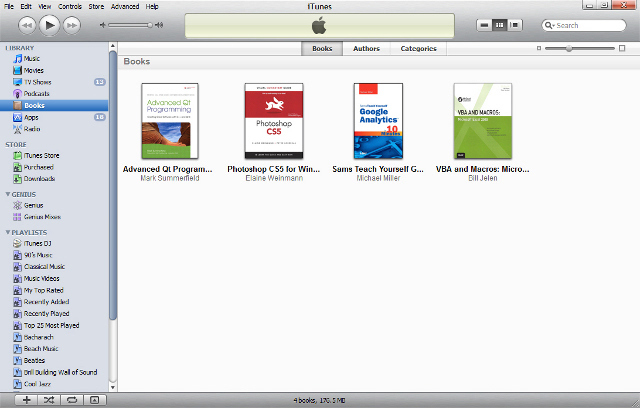 iBooks can read eBooks in both EPUB and PDF formats. It is best suited, however, for reading EPUB-format books, which flow automatically from page to page on your device's screen. 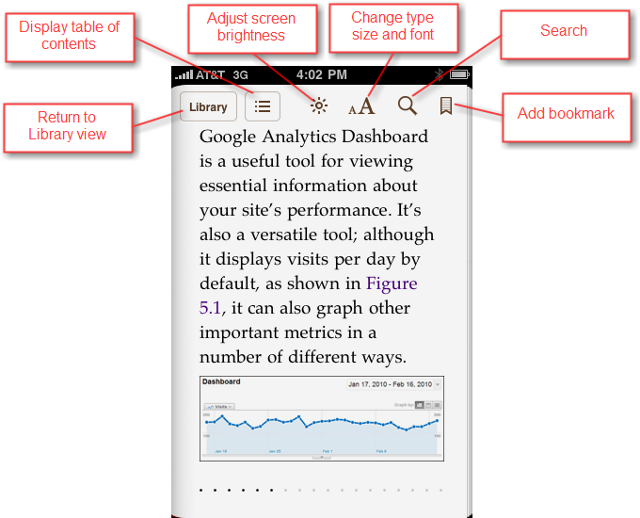 You can easily increase or decrease the size of the book's text, and iBooks instantly reformats the pages accordingly. To download iBooks to your device, go to the Apple App Store and search for "ibooks." Follow the onscreen instructions to install the free application. When available, you want to purchase the EPUB version of a book to read on your iPad or iPhone. If an eBook is available in EPUB format, you'll see a link similar to the one below. Click the Buy button to purchase the eBook. Click the link to download the eBook in EPUB format. Once you've downloaded an eBook, you need to add it to your iTunes library and copy it to your iPad or iPhone. Open iTunes and select the Books library. Open the folder where you downloaded the eBook and drag the eBook file from that folder to the iTunes Books library. The next time you sync your iPad or iPhone to your computer, the new eBook will be copied to your portable device. Viewing eBooks in the iTunes Books library. If the title is not available in EPUB format, you can still purchase and view it in PDF. Know, however, that PDF eBooks do not feature the user-sizeable text or flowing pages found in EPUB books. When you launch iBooks on your iPad or iPhone, you see the Library, a virtual bookshelf that holds all your purchased titles. You can scroll through multiple bookshelves to view all the books you've downloaded. Tap a book cover to begin reading. 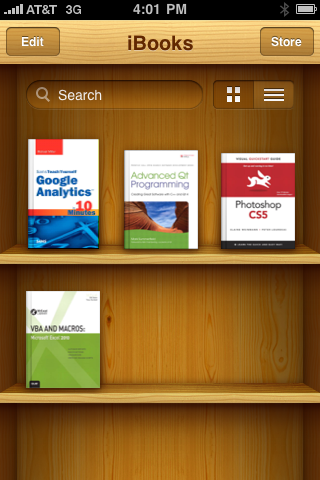 The iBooks Library on an iPhone. To turn to the next page, swipe your finger across the current page to the left. To return to the previous page, swipe the page to the right. Viewing an eBook on the iPhone. To jump to a specific section in the book, tap the Contents button. 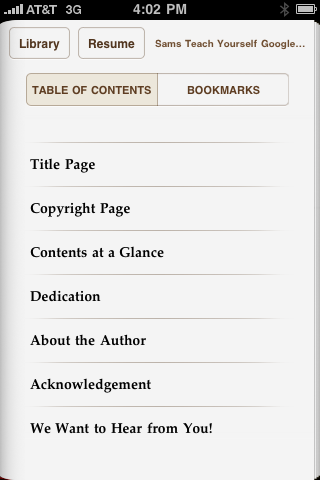 This displays the Table of Contents page; tap a chapter or section title to jump to that section of the book. Viewing an eBook's Table of Contents on an iPhone. To search for a specific word or phrase, tap the Search (magnifying glass) button. When the Search screen appears, enter the term you're looking for into the Search Book box, then tap the Search button. All instances of the word or phrase are now listed; tap an instance to jump to that point in the book. To change the size of the onscreen text, tap the Fonts button to display the Fonts panel. Tap the small A to decrease the size of the text; tap the large A to increase the text size. Changing the size of onscreen text on an iPhone. You can also change the font displayed onscreen. Tap the Fonts button to display the Fonts panel, then tap Fonts. This displays a list of available fonts; tap the one you want to use. By default, iBooks displays all text against a bright white background. 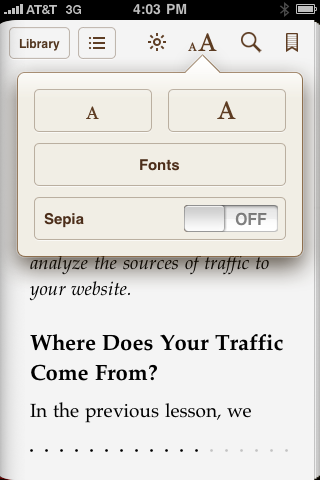 If you'd prefer a more muted sepia background, tap the Fonts button to display the Fonts panel, then tap the On/Off button in the Sepia section. Other eBooks are sold without DRM and can easily be copied to up to six devices. You cannot share these eBooks with other people, however. Our non-DRM eBooks are embedded with personalized watermarks that help us identify any unauthorized copies found online. For more information on watermarking, see our Watermarked eBook FAQ.